Chinese Pens Show And Tell. 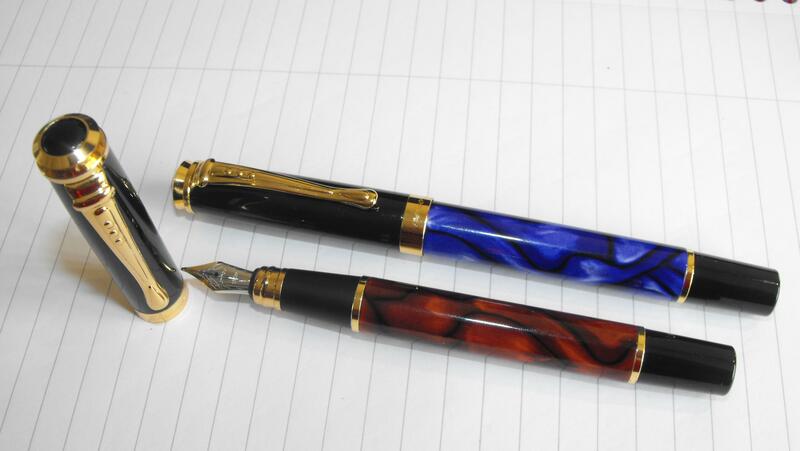 Won bids on a couple of the Hua Hong "brown lava" pens, which are lovely. 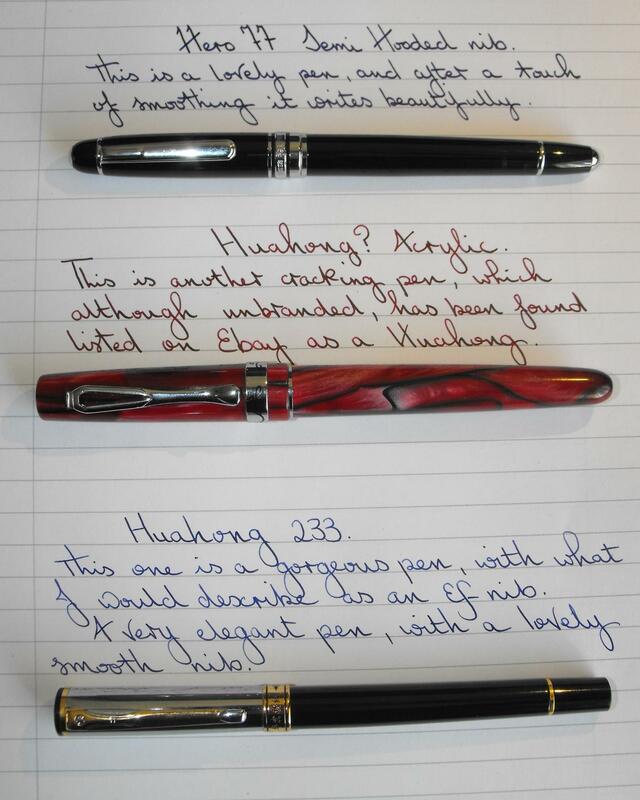 But just received this week the Hua Hong "red lava," which is truly amazing. It's tough to distinguish between the two colors in the photographs for the listings, unfortunately. Great thread. Really enjoy reading the posts. 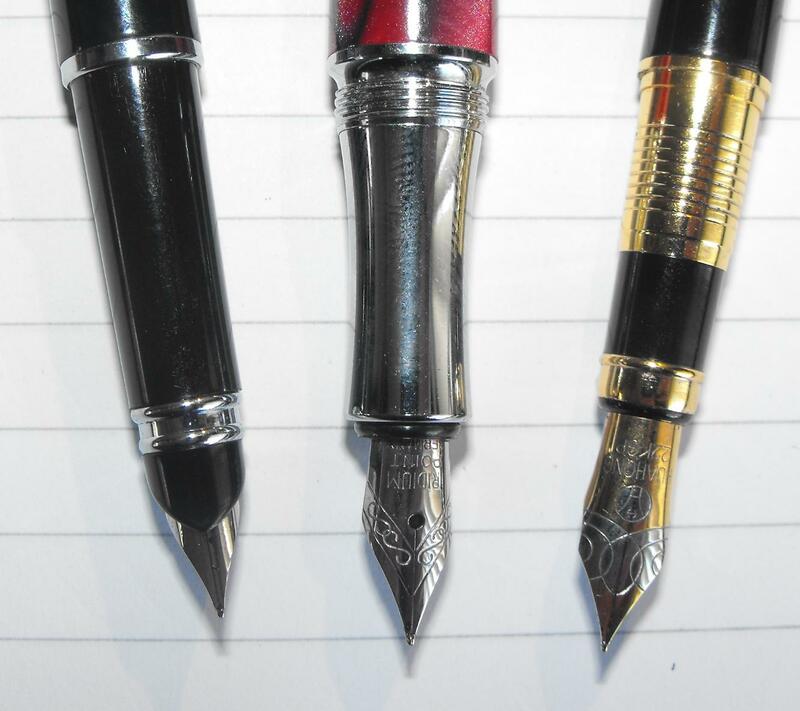 Could you please suggest some pens with EF or F Nibs,which are also light weight? The Hero 77 may suit. Really well made pen. Nib is reasonably fine if I remember? - but they can be ordered in fine for sure. 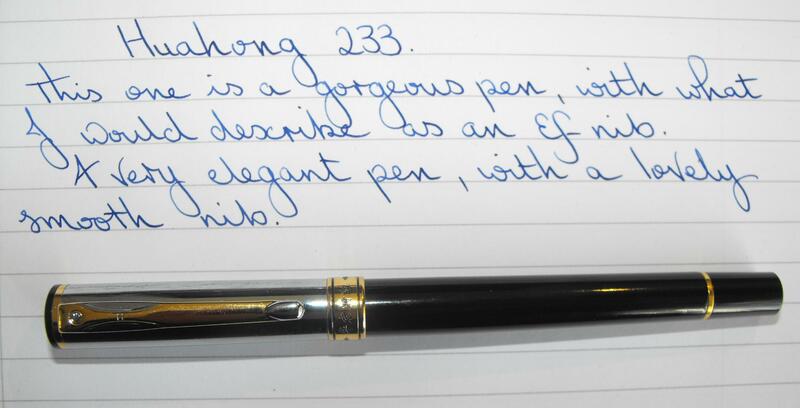 The 382 is nice as well, but heavier, Super reliable well made pen though. If I get time today I'll dig out my "fineys" and do a group S&T. But remember, I can only talk about the pens I have, and there are many, many more out there. I will include the 77 Luvpens mentioned, as it's another excellent pen from Hero, which Luvpens has a knack for "rooting out". (thumbs up, smiley thingy). It’s a well kent fact that Scotland (The Land Of The Rising Water) has the most beautiful, picturesque, colourful, history laden landscape in the world. It’s just a shame that you can only look at it through a rain soaked car window. Every cloud though, If there was no rain, there’d be no RAINBOWS. If you are walking the dog through mountain bike country.....don't wear headphones. It's a cracker Bob, and the pics don't do it justice at all. I quite fancy the black and silver version as well, as it looks really nice too. Great thread - please keep them coming! 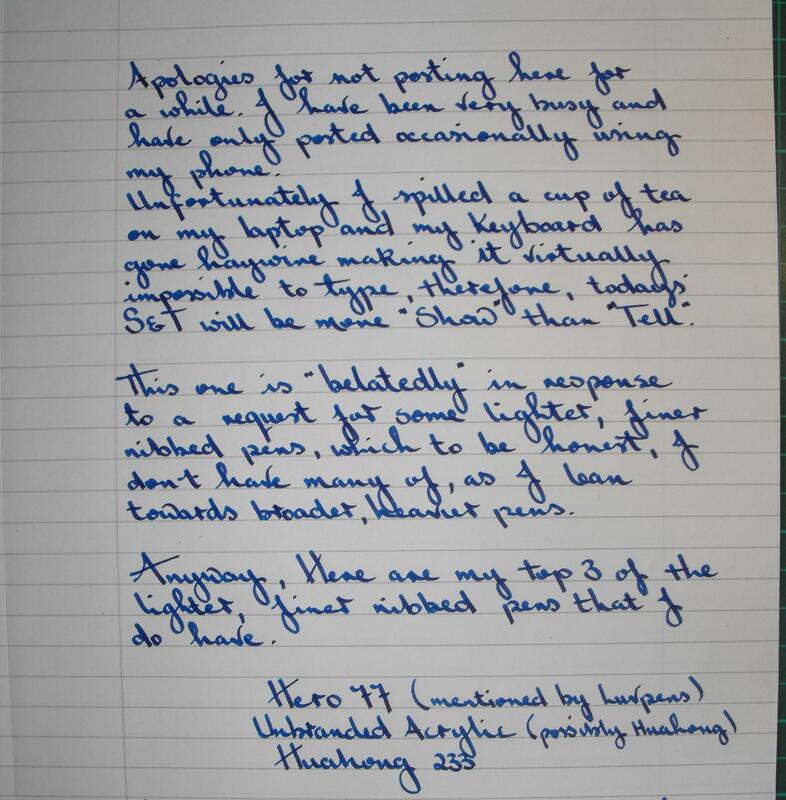 I'm having problems with my laptop, which I explain later, but I'm having to add the text using my phone, then edit using my laptop to add pics, so this might end up a bit "all over the shop"
The Hero 77 is a really well made pen, extremely robust and has a very attractive looking semi-hooded nib. The build qualty is excellent and although on receipt the nib had a bit of feedback, which wasn't unpleasant, I gave it a bit of a smoothing as I like my nibs "buttery"
All in all, an excellent pen. This unbranded acrylic pen was a steal. 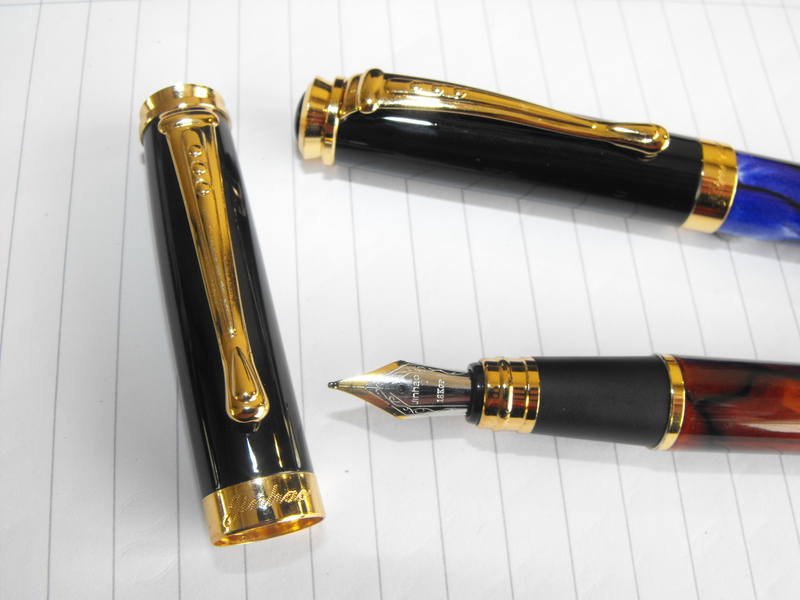 It has a lovely smooth fine nib and writes wonderfully. 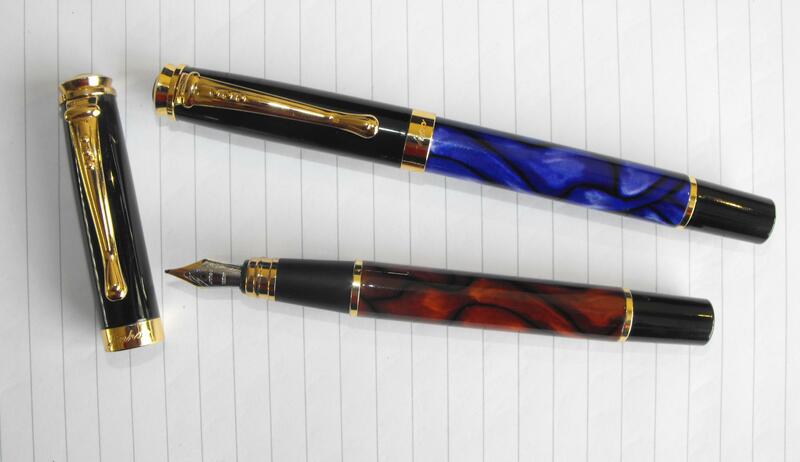 Both the barrel and section threads are metal, which is unusual in such a low cost pen, which is overall a pretty well made pen that looks great too. An absolute stormer of a pen. Really well made and writes wonderfully. You won't find it listed anywhere by its name, but a search of the usual vendors' store on ebay and you'll find it. It comes in various guizes (I have 3) but this one with the polished mirror cap is a beaut. I hope this has all worked out as planned.. otherwise it will look a bit "odd" to say the least . Ian Edited to add.......Phew! it seems to have worked out not bad. Edited by Ian the Jock, 23 September 2015 - 13:53. Ian, great write-up. What ink did you use in that red acrylic pen? I love the shading! It can be had for under $2 too, if you play the ebay auctions. There is a cracking new blue version out now, but it's still a bit costly yet due to it being "new"
Nice handwriting btw. Its been a long time since I saw writing thats tilted so prominently to the left. If anyone has been admiring the Baoer 508 shown on the first page of this thread (I bought one because of it), I recommend giving the Baoer 3035 a look. It has a shape that's almost identical to the 508, but has a nib shape I like better. (It only comes in black, stainless steel, and white, though. I love the 508's blue.) The feel of these pens is really nice, too. If anyone has a spare Hero 812 in white that they're willing to part with, please PM me. I'm trying to find one for my collection. "He thought the pen was mightier than the sword... Until he went to war and met a soldier with a sword." I have a Hero 100, which is a great writer. The issue I have with many Chinese pens is how many design elements they copy from European and American brands. The same is true of Chinese watches for me; there aren't that many truly original designs, and those that are unique, are discontinued rapidly. I do expect that Chinese manufacturers will find their own style over time though, and that we will see one or more Chinese luxury brands eventually. Edited by jthole, 26 September 2015 - 06:40. The Baoer 3035 is a great pen, and was actually the first fountain pen that I got, along with an x450, and of the 2, I much preferred the 3035, as I still do now. The styling of it is really nice and is "right up my street"....and it's an excellent writer too, so win/win. Im still having issues with my keyboard, so mostly pics again for this show & tell, as typing using my phone is giving me a headache (fat fingers and touchscreen keys aren't happy bedfellows). Edited by Ian the Jock, 29 September 2015 - 14:39. Sadly, it has a metal section. 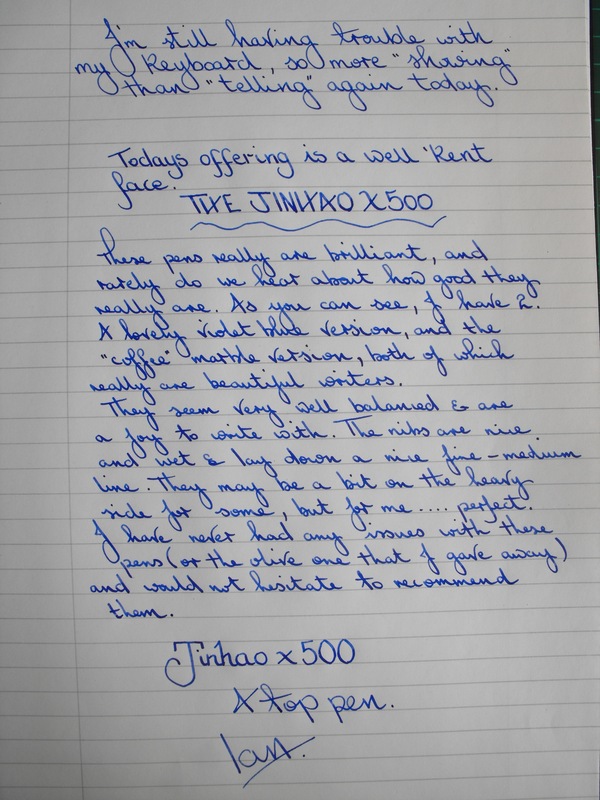 The Jinhao models x250, x500, 159 have served me well. They write well. The x250's are the red marble barrel , the x500 are black & white chessboard barrels, the 159's are black. They are the quieter, conservative designs. 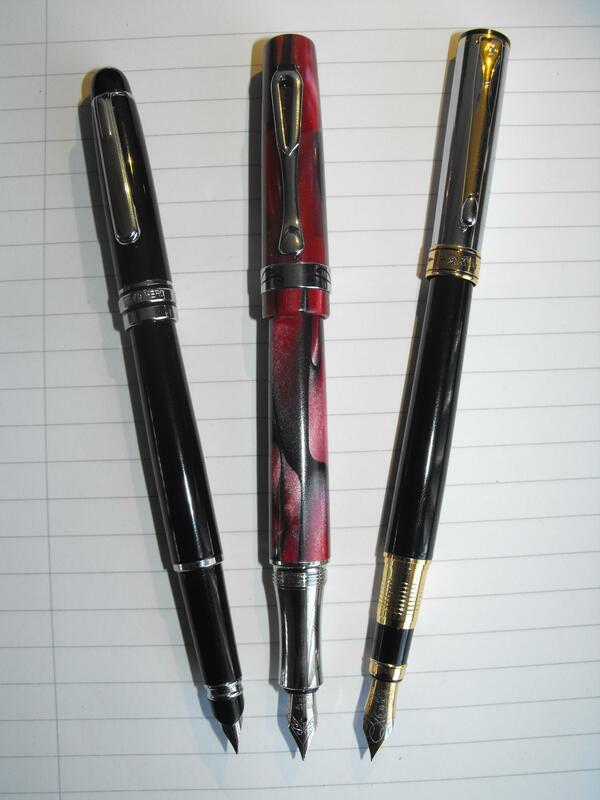 It is purely my personal taste and personal prejudice that deems the "art" in Chinese pens to be distastefully gaudy. Thanks for sharing your fine penmanship. Makes me want to try harder. Edited by Sasha Royale, 30 September 2015 - 18:29.